Lulu Companion mask is from Gypsy Renaissance's Leather and Lace collection. Lulu Companion is a teal masquerade mask with sequins and aquamarine rhinestones. Lulu Companion mask is covered with teal moiré fabric overlaid with black mesh and trimmed with black braiding and teal sequins. 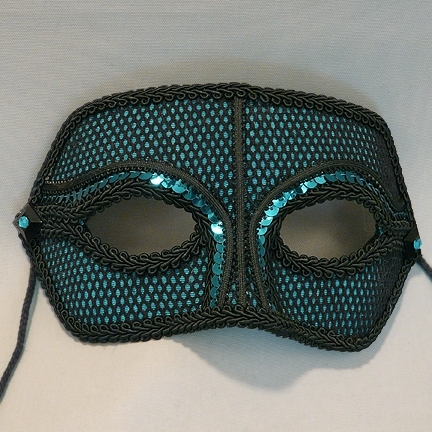 Mask is finished with black jet jewels and aquamarine rhinestones. Click here for Lulu mask. Click here for Desiree' mask.